This weekend I went to BEAM Day, a day of workshops for creating music and sound art machines. This day is part of this years events for the BEAM 2012 festival taking place 22-24 June at Brunel university. I can’t make the festival this year, so the BEAM day was a good chance to meet some people creating and experimenting with electronic music, sound art and performance controllers. 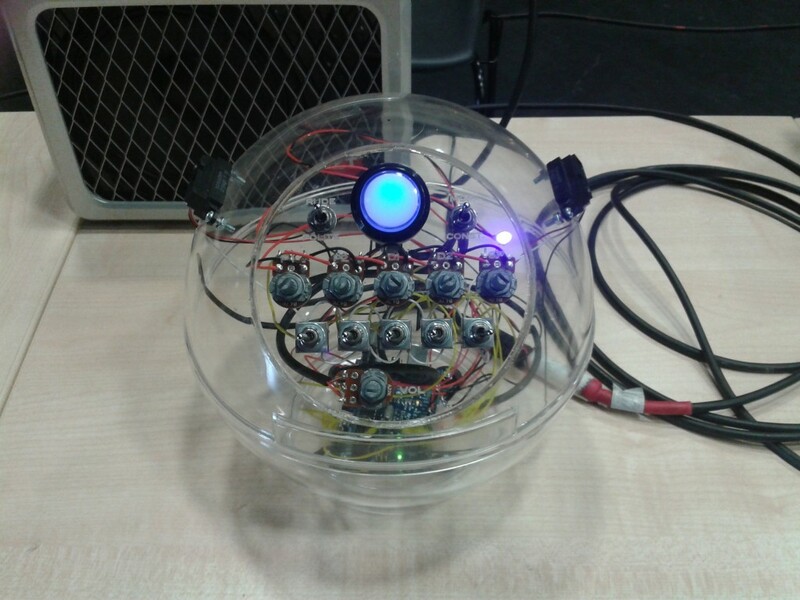 Alex Allmont created a collaborative workshop to build an electro-mechanical noise machine, the Polytherelegomuino. 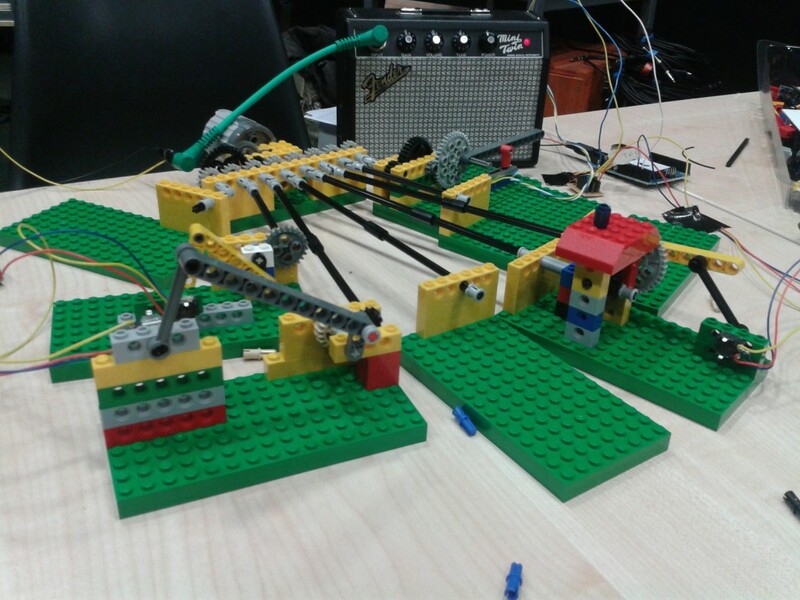 People were invited to build mechanisms out of LEGO that would in turn operate the controls of electronic synths. Each participent had a LEGO board to create a mechanism on with a turning shaft providing power, all driven from a central motor. The result was like a robotic synth knob-twiddling noise factory! One of the Polytherelegomuino machines at BEAM Day 2012. I built the board to the right with the 'hut' on it, which housed a worm drive mechanism for slowly turning a frequency knob connected to the Arduino based synth. Here’s a video of the final machine taken by Alex – WARNING: watch your speaker level, this is NOISY! The synths used in the Polytherelegomuino are based on the Arduino synths of Mike Blow’s optical theremin instruments, the Theremuino and Energy Ball Theremuino which Mike was demonstrating on the day. Mike Blow's Theremuino at BEAM Day 2012. Mike Blow's Energy Ball Theremuino at BEAM Day 2012. Codasign ran a workshop for controlling OSC compatible audio software, such as Max/MSP, with movement gestures via a Kinect. The Kinect to OSC interface they were using is built in Processing using OpenNI libraries, which allows a person’s movements to be tracked and mapped to OSC parameters. In the workshop they showed how a synth in Max/MSP could have parameters like pitch, number of harmonics and filter cutoff controlled by hand movements and standing position, all tracked through the Kinect. Other workshops included Bruno Zamborlin’s mobile phone (accelerometer) based gesture recognition for controlling sound and Noisy Toys circuit bending workshop. 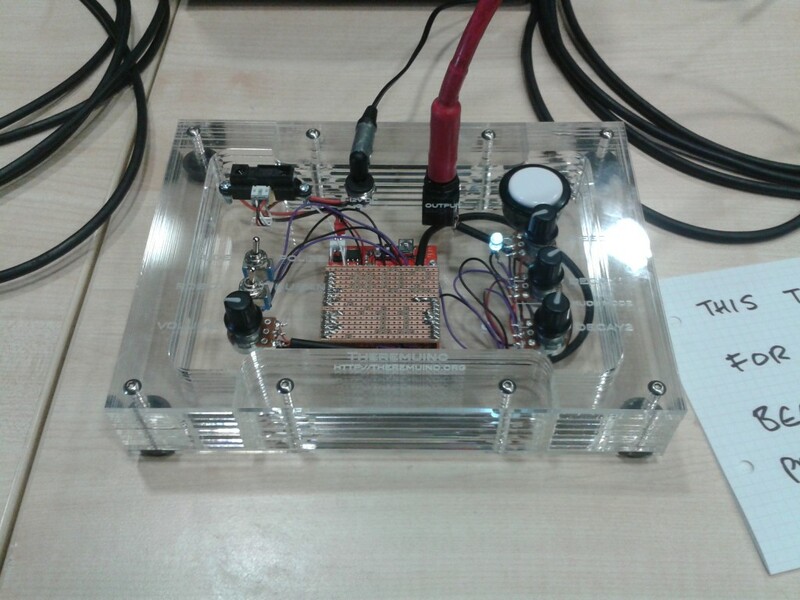 This entry was posted in Event and tagged BEAM, electronics, mechanics, noise, theremin, workshop by Arran. Bookmark the permalink.